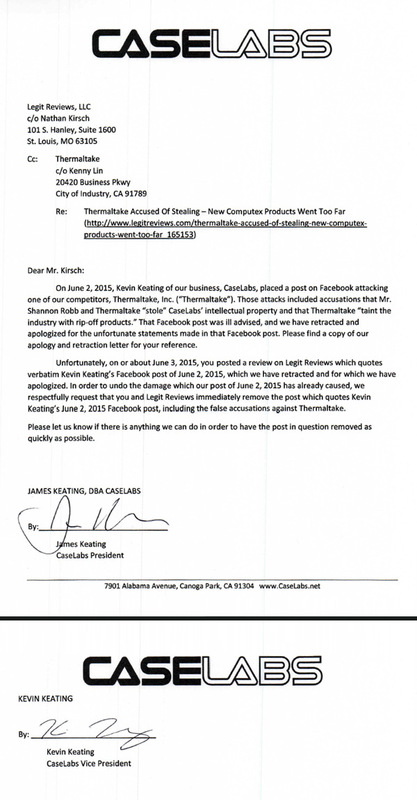 California, U.S.A －July, 16, 2015 －CaseLabs, a manufacturer of computer cases, has issued a letter of retraction and apology for its recent attacks upon competitor Thermaltake, Inc., another manufacturer of computer cases and other computer components. Recently, CaseLabs and some of its personnel, including Kevin Keating, posted attacks upon Thermaltake. Those attacks have included accusations that Thermaltake and one of its employees, Mr. Shannon Robb, "stole" CaseLabs' case design and engaged in unfair competition. CaseLabs now regrets those statements and apologizes for making them. “CaseLabs acknowledges that it does not own any patents on any of its case products. CaseLabs' postings, which suggested that litigating to enforce patents would be prohibitively expensive, were misleading, because they implied that CaseLabs actually owned patents, which it does not. CaseLabs regrets this error. 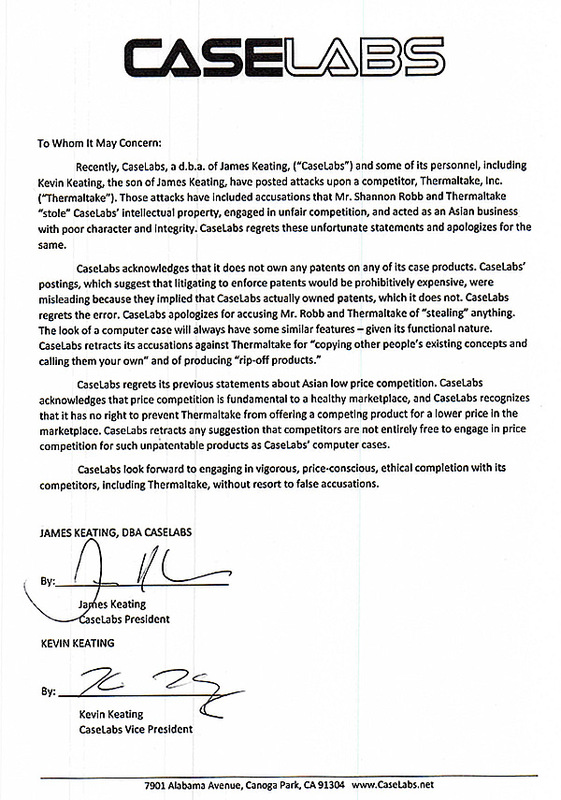 CaseLabs apologizes for accusing Mr. Robb and Thermaltake of "stealing" anything. The look of a computer case will always have some similar features - given its functional nature. CaseLabs retracts its accusations against Thermaltake for "copying other people's existing concepts and calling them your own" and of producing "rip-off products." CaseLabs has also written to ask Nathan Kirsch of Legit Reviews to remove his article regarding CaseLabs’ accusations against Thermaltake. Copies of CaseLabs’ retraction and apology letter and CaseLabs’ letter to Legit Reviews are enclosed.